We’re continuing to examine topics from the recent two-day public workshop we jointly hosted with the Department of Energy regarding non-light water reactor designs. One topic getting a lot of attention is the possible costs for NRC reviews of applications for these designs. 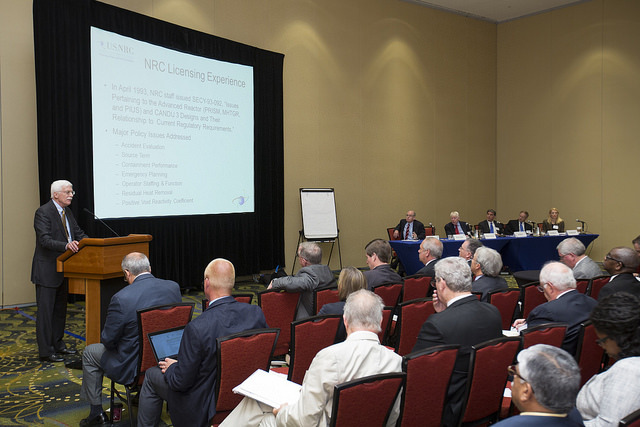 Last month’s workshop included presentations on the NRC’s experience licensing non-light water designs, as well as discussions of proposed advanced reactor designs. For instance, some people interpreted a DOE presentation on the Next Generation Nuclear Plant project as saying it costs $800 million to receive a final certification or license from the NRC. The bulk of that $800 million, however, falls outside of NRC fees and would be made up of the designer’s costs to develop and test its design to ensure that it works as planned. In other words, the designer does not pay the NRC $800 million to review a reactor design. Looking at recent reviews of large light-water reactors, we see designers spent approximately $50 – $75 million for NRC fees to certify their designs. A recent Government Accountability Office assessment, “Nuclear Reactors: Status and Challenges in Development and Deployment of New Commercial Concepts” says costs can be “…up to $1 billion to $2 billion, to design and certify or license the reactor design.” A different portion of the GAO report, however, pointed out most of these costs aren’t attributable to the NRC review. The largest part of the price tag would be research, development, and design work to develop and test a new reactor design. We can also examine information from the public workshop on design development costs versus NRC review costs for the developer of a new small modular reactor design. The company said that of approximately $300 million in design investment to date, only $4 million of that amount (or slightly more than 1 percent) is from NRC fees for several years of pre-application interactions with the agency. Here’s something to keep in mind: NRC review costs depend on the quality and maturity of the applicant’s information. The NRC always aims to efficiently and effectively review designs. Incomplete or inadequate information will very likely increase costs, however, since the NRC will spend more time and effort getting the data necessary to determine whether the reactor could operate safely and securely. Everyone benefits from a common understanding of NRC costs as we discuss the next generation of reactor designs. The NRC’s website has more information on how the agency is approaching advanced and small modular reactor designs. Anna – The estimate for NRC fees that you mention for NuScale might be a small portion of the total development cost, but that reactor design is a refined version of existing light water reactor technology. NuScale’s cost included the preparation of a design specific review plan, but most of the work in defining the review processes has been done over many years. Now think about the fee hurdle for an innovative developer that has done the homework required to convince itself and a team of knowledgable designers that a different technological path offers the potential for improvements in safety, simplicity, maintainability, security, reliability and staffing. Because the NRC has no defined path for review of non-light water reactors and limited expertise in many of the alternative paths (molten salt, molten salt cooled solid fueled, sodium fast reactors, nitrogen cooled gas turbines, or lead cooled reactors, for example) reviewing non-LWR reactors will involve a lot more regulator time. A large portion of that time will be invested in simple education and training activities. It might be defended as not being a very large cost, but there is something wrong with a system in which a world leading technology company might have to pay the US government $5600/hour to hold classes for 20 regulators at a time to teach them the basics and then the advanced concepts of their proprietary technology. If becoming a competent regulator for a new technology requires the equivalent of a 3 semester hour course for each involved person, you can see how the costs can quickly become something worthy of complaint and correction. Just imagine the cost hurdle imposed if it takes longer than that to become an expert capable of regulating the technology. PS – I realize that the NRC cannot correct this situation. Legislation will be required. Yup, I agree. Virtually every picture below the Commissioners needs to be replaced before the Agency name needs to be changed to Dry Cask Storage Regulatory Agency. Thank for you noticing. We’ll fix the org chart shortly. Anna: I was saddened to hear the sudden passing of Ralph and I connected the picture of him making a public presentation here projecting a very positive image of the Agency and in his passing makes him a real mortair. Indeed there are are devoted individuals like him to make this agency hold its shoulders still high. P.S. The agency’s organization chart needs a serious fix up. Looks rediculous showing Glen’s and Brian’s pics totally mixed up. Needs fixing, just a thought!! NRC costs are 90% funded by industry in their application – as far as I know this isn’t the case for other industries. Further, the government makes loan guarantees available but charges a high enough rate for them that sometime the industry chooses not to use it. The government does make money off of the nuclear loan guarantee program. 2) No nuclear “designer” or contractor or operator “pays” for anything. It is all ultimately foisted upon the backs of the rate payer. Even blatant mistake and lies like the “like for like” heat exchangers at San Onofre. I believe that “cost” numbers are always inflated because the Industry wants to complain about how much it costs them, hoping to get grants, subsidies and/or money from the Government. If they did a better job of listing the costs and describing what these costs were for, then the public would better understand who is paying for what and when. It always surprises me that since the Government often is involved in financing new reactors, nothing is ever heard about the Government recouping its money or receiving a return on its investment! I urge you to develop a better NRC accounting system that not only keeps track of costs but does so in an easy to understand format. This will allow everyone to better quantify the cost for new reactor R&D, designing specific reactors, the approval process and even the construction costs. This will not only keep taxpayers up to date on the overall cost of new nuclear but will allow fair comparisons between Nuclear and other forms of Energy Generation.